First off let me say that last night was great, the live tweet event went really well. I had fun talking to y'all while we watched Pretty Little Liars. We have to do it again. (My Twitter) (Live Tweet Twitter. ), I like to keep my regular twitter and live tweet different from each other so I don't be flooding people timeline. Anyways like we always do at this time. If you haven't watch yet, stop reading. On the bright side though, this episode was a MAJOR clue in finding out who was A and if Alison is still alive. At the beginning of the episode we see Ezra putting on the gas mask/suit. The same suit we saw in A's Lair. Next we see another guy with he same suit, but without the gas mask. But the liars have no idea who he is. He possibly couldn't be a part of the A team. After the party, they followed red coat into a crypt in a graveyard. 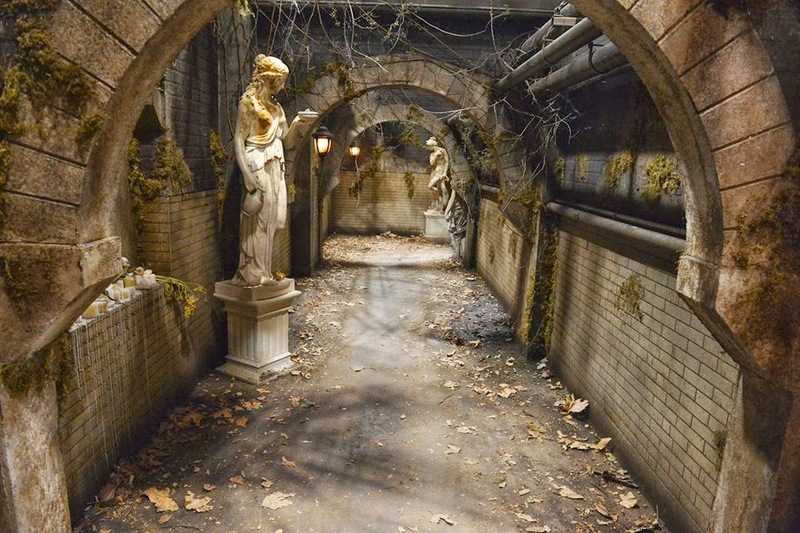 The liars are split up midway and Hanna finds her way into Grunwald's mansion. Hanna gets stuck in a telephone booth. Soon after, she sees Alison through the foggy glass, and (I think) gas-mask man behind her. Miranda lets her out a few seconds later and they walk into a coffin room.. The other liars then find their way into the mansion, hearing "Alison" screaming for help. They lose Spencer. Spencer finds her way into a greenhouse of some sort where she meets face-to-face with gas-mask man. They fight and just as Spencer gets him to the ground and is about to take off his mask, gas-mask man pushes her away and runs off. Hanna and Miranda find their way outside. The other liars meet up with each other again after finding Spencer lying on the ground in the green house. They walk back into the mansion to hear "Alison's screaming" again. They follow it and until they reach a room... where they realize that "Alison's screams" were just a recording. Grunwald walks in on them and tells them that this is her mansion. Then she tells them that the recording they hear was stolen six months prior (I think). Grunwald then gets a "feeling" and tells the liars, "one of you has been touched by the one Alison fears" or something along those lines. They leave the mansion to find their car has a flat tire. While fixing it, Hanna comes back. Ezra then soon arrives who offers them a ride. They accept. Back in Rosewood (I think, I'm sorry) They see redcoat (who by the way, think is Alison) after following her, they stop her. Only to reveal that it is, Alison. Alison tells them that she needs their help. She "shushes" them and motions them to turn around, looking scared as hell. The liars turn around to Ezra who has Aria's phone. Ezra gives Aria her phone back and when the liars turn around, Alison is gone. I didn't feel like including the Miranda and Caleb parts when they were on the bus and in the graveyard just because I don't really think that he means anything to the story. Now, I am almost 99.1% sure that Ezra ia A. Here are my reasons. ~The same gas-suit we saw in A's lair, was being worn by Ezra. We know that because we saw him put it on. ~When Spencer was fighting with the gas-mask man, you can hear pretty clearly that the "grunt" noises being made were by a male. Not the mention the black hair that is seen when gas-mask mans hat fell off. ~Grunwald said that she has a feeling that one of the liars has touched the one Alison fears. Aria and Ezra. (Alison is probably scared of Ezra because he may be board shorts). This episode did give some great clues however. After figuring some of those out, I am pretty sure that Ezra is A which is honestly the biggest plot twist. (Finding out Alison is alive wasn't that shocking, it is just the wondering of who was in the coffin? I think the possibility of twins is pretty high). This is pretty much my summary of tonight's episode and some of the clues I picked up. Sorry by the way if there are some spelling/grammar mistakes. I'm typing this pretty fast, I'm so shaky! EDIT 2: "I bet Ali's the pregnant girl that Ezra's mom paid off to get out of town. Not Maggie.. Because Malcolm isn't even Ezra's." - I found this on Twitter. It doesn't relate but it may be a good reason as to why Alison is scared of A and why he's chasing her or something... Good point you guys. All this is from flashyflashy.